The following is an excerpt from president Ted Wilson’s sermon on the last Sabbath of the GC Session. You can read the whole sermon below. Go forward, not backward! Stand firm for God’s Word as it is literally read and understood. Of course, we must always humbly recognize that we are finite, fallen creatures observing the works of an infinite omnipotent God. There are things in both of God’s two great books of nature and Scripture that we do not fully comprehend. In fact, we are told that the sacrifice of Jesus will be “the science and the song of the redeemed throughout the ceaseless ages of eternity.” But that which the Lord in His mercy has given to us in clear language to be taken as fact simply because He said so must not be shrouded in skepticism. Don’t go backwards to misinterpret the first eleven chapters of Genesis or other areas of Scripture as allegorical or merely symbolic. As just this week we have once again affirmed in an overwhelming manner, the Seventh-day Adventist Church both teaches and believes in the biblical record of creation which took place recently; in six literal, consecutive, contiguous 24 hour days. The Seventh-day Adventist Church will never change its stand or belief in that foundational doctrine. If God did not create this world in six literal days and then blessed the Sabbath day, why are we worshipping Him today on this seventh-day Sabbath as SEVENTH-DAY Adventists? To misunderstand or to misinterpret this doctrine is to deny God’s Word and to deny the very purpose of the Seventh-day Adventist movement as the remnant church of God called to proclaim the three angels’ messages with Holy Spirit power. Don’t go backwards to atheistic or theistic evolution, go forward to the prophetic understanding that loyalty to God, the Creator and Redeemer, will be seen in the observance of the seventh-day Sabbath as the distinguishing characteristic of God’s people in the very end of time. Seventh-day Adventist Church members, hold your leaders, pastors, local churches, educators, institutions, and administrative organizations accountable to the highest standards of belief based on a literal understanding of Scripture. Utilize wonderful resources such as the Biblical Research Institute’s new book on hermeneutics that helps us know the correct way to interpret the Scriptures. July 3, 2010 in Featured, News. Oh, what a message! One we do not often hear. May God tenderly hold up Elder Wilson as he leads God’s people. Praise God for this wonderful message. I am so encouraged and so blessed. It was a refreshing sermon and one, if placed into action, should advance the Kingdom appreciably. I can only commend our new GC President for his candid sermon, one that I needed. What we needed was a clear message that drove a wedge between Progressive Adventism and authentic Adventism. That’s what we got. Phinehas threw a javelin through the belly of progressivism. May the Lord bless Elder Wilson as he moves ahead. “The Great Controversy Theme” – he actually mentioned this! Praise the Lord and Thank you! Oh, how long I wanted hear this kind of sermon from the GC president! “Son of man, I have made you a watchman for the house of Israel; so hear the word I speak and give them warning from me. Ezekiel 3:16-18 We are grateful for a man of courage and integrity! May God’s Holy Spirit fill Elder Wilson and the rest of the church leadership with wisdom and a humble attitude toward God’s Word and its principles and standards and may we, the lay people, support God’s cause with all our strength and means. We are encouraged! God has spoken through Elder Ted Wilson! Praise the Lord for a strong, faithful leader of our church. So far, it sounds like we have someone with a backbone as President. I also realize Wilson will be fought “tooth and nail” by liberals to defeat what he has spoken. Adventist Today and Spectrum will begin, or have already begun, their attacks and fear-mongering about how this is “horrible” for our SDA Church. Yeh, “horrible” that we actually have someone who is not afraid to stand up for God’s Truth! Hmm, I’m pretty sure that’s not how I remember that one going. AMEN…What a great sermon. Praise the Lord. He needs our prayers as we know he will be attacked for this! @Bravus: It sounds as if you’re making a parallel between removing employees who misrepresent the Seventh-day Adventist Church and members who fundamentally disagree with the church. It’s one thing to be a member of our church and disagree, but it’s another if you’re promoting ideas that undermine the fundamental beliefs of the church while you’re a paid employee. Hmm, Iâ€™m pretty sure thatâ€™s not how I remember that one going. All are welcome who actually wish to worship with the SDA Church body – regardless of their opinions or background. However, not all are welcome to expect a paycheck from the Church as paid representatives of what the SDA Church stands for because not all who would take such a paycheck actually subscribe to the Pillars of the SDA faith. Praise God for the power, clarity, and courage of what may well be remembered as the greatest inaugural message of any General Conference President in Adventist history! Not only did he reaffirm strict Biblical creationism, “spiritual” formation, the emerging church, etc, but he also denounced the false understandings of the gospel so prominent in contemporary Adventism, such as justification-alone salvation. His reference to Christ’s Object Lessons, p. 69, regarding the perfect reproduction of Christ’s character in His people as a prerequisite for His second coming, will cheer the hearts and restore the broken spirits of thousands, perhaps millions, of the striving faithful among us. At long last, let us pray our church has the Josiah for which the godly and consecrated have so long hoped and prayed! Sorry for the confusion above!! Elder Wilson AFFIRMED strict Biblical creationism but ATTACKED the other elements noted above, such as “spiritual” formation, the emerging church, higher criticism, etc. Sorry to misspeak! Bravus, it is not a worthy goal to keep people who are undermining the church within the church. Weak members, yes; sinning members, yes (that’s all of us); but people who are deliberately and persistently counteracting the very purpose and mission of the church (though they may not see it as such themselves, because they have an aberrant view of what the mission and purpose of the church is… yet it is still deliberate) … absolutely not. I was privileged to hear Pastor Wilson’s message in person. What an inspiration it was! I was glad to hear a firm, unwavering message from the new president of our church. Perhaps if I send contact details of my local church you would send a letter to the board clarifying their misinterpretation of your calls for doctrinal purity and purging of the church. Are you prepared to do that? Whether you like it or not you are the modern day “Concerned Brethren” and your site is the focus of a purge mentality which will spread way beyond what you imagine. Where is everybody getting this quote? I reread the sermon and cannot find it in there. If it’s from the Spirit of Prophecy, which book and page? I want to read the whole context but am not finding any “key words” in the Indexes. I can’t begin to tell you what a wonderful Sabbath this is between a most inspiring sermon today on out-reaching through Glow and coming home to this sermon. God is at work…..no doubt about it. I was very encouraged with the message from the President today. I keep him in prayer and I am also praying that the leadership that he provides through the power of the Holy Spirit will encourage other leaders and individuals to examine the heart, study, and have the courage to also follow what the Bible is teaching. “secular doubt in the Bible” “liberal interpretation of the Word of God” and “spiritual confusion” are certainly accurate descriptions of what is going on at LSU! Now, President Wilson–what are you going to do about this? Did Wilson explain how SDA members can actually hold our leaders accountable? We have many leaders out here in the Pacific Union Conference who have not been accountable and still aren’t, but what can ordinary “Joe and Jill Schmo” church members do? This man, I believe is the last Head of the GC, before Jesus comes. The Lord placed him there to give one last and loud push of the 3 Angels messages. He will create controversy and draw attention to the SDA. It is all good. It was a great sermon and a number of issues that will lead God’s people to fall at the Jordan were addressed. Ted walks in the shadow of the cross. I am not exactly sure what your comment means. Why do you forsee people being driven from the church? Is it because you see that there are many who have apostatized from the Truth in our church, who are not willing to live according to the beliefs and principles that the church has been founded on? These people are not driven to do that, that is purely their own choice. We all have choices to make. Personally, I don’t see what good it does anyone to belong to the church if they don’t agree with its beliefs. By becoming members of the church, we take vows to believe in the principles laid down by it. If people do not want to live according to this set of principles, why do they want to be part of the organization at all? We cannot hold to the world with one hand and God with the other. Belonging to this church takes a 100% commitment to God; nothing less will save anyone. The biggest part of working out our own salvation is to submit the will to God and to overcome self. God does most of the work of salvation for us, but this part we must do. We are not to court the world, its methods, its theology, its applause or esteem. If this is where our hearts are, then we disqualify ourselves for membership with the true people of God and for citizenship in heaven. God requires total allegiance…nothing less will be acceptable. The people you fear will be driven from the church have the opportunity to make the choice between life or death. Choose ye this day who ye will serve. Either they will love God enough to follow His will or they won’t be qualified for the church here on earth or in heaven. It is as simple as that. I pray that as many as possible will open their eyes, see and accept the truth God has so graciously given us, and be saved. I am much encouraged by reading the above sermon. I believe our prayers for the church are being answered. I look forward to seeing the truth of the church being upheld at long last. Hopefully this issue with LSU will be solved along with many more problems that have crept into the church. I continue to pray that God will strengthen the hands of His servant Elder Wilson as he leads our church toward the reformation it has so badly needed for so long. This was such an inspiration as a theology major, this is what needs to be preached. I was smiling ear to ear after reading this. The Holy Spirit is moving upon the church and the GC session. May God continue to guide Elder Wilson in the future and his leadership for the church. My prayer is that all the leaders in the conferences, churches, and colleges step away from the watered down sermons being preached and proclaim the 3 angels messages, righteousness by faith and the baptism of the Holy Spirit that is so desperately needed. We are on step away from heaven, let us not prolong that step anymore. An excellent sermon that was needed. Now it’s forward to the Kingdom! I can’t wait to see how the good Lord leads His Church over the next three years. Remember… all changes to our fundamental beliefs need to be submitted to the GC two years before the next GC Session. Let’s pray that our leaders will truly allow the Holy Spirit to guide. It looks like we are about to have a “shaky” ride. We are so encouraged! It seems like a new day has begun in Adventism. Praise God for His faithfulness. I think the implication was that consituency meetings need to be a bit less “rubber stampish” and that conference church boards of elders etc should be writing to both the conference leadership and to the Union leadership letting them know that that local church is behind Elder Wilson’s message. (That is going to be a pretty tough order for one or two congregations in SECC – but I think that Elder Page’s conference might be able to come up with a suggestion or two). Also, as Ted Wilson stated in his “Yes, Creation” talk – LSU is not the only place where this is a problem but it is the most visible and the most extreme. Ted Wilson has chosen to meet the current challenges facing the church “head on”. I pray that the constituents (especially in countries like my own NAD, where the problems are most pronounced) will get behind our new leadership with more than just words. I read the manuscript of Elder Wilson’s message, and I am convinced that God is closely watching His remnant church. This may lead to the revival and reformation we have been waiting for. Praise God!!! If this sermon is any indication of things to come, I am thrilled. I believe also that he will be the last GC president, and if so we’ll see many members shaken out over the issues. There are so many people sleeping peacefully at this time and others who have fallen into some very strange views and they desperately need our prayers. We need to follow Ted Wilson’s strong lead as individuals in our own churches and not sit silent when truth needs to be spoken. A very kind, gentle but strong pastor in Anchorage Alaska spoke the truth in his church just as surely as Jesus did. Most of the congregation left because the truth didn’t appeal to them like the freedom to have skits, worldly music and white washed sermons with loads of humor to keep them in stitches. While visiting up there after this shaking, it was hard to see only a few pews worth of people on Sabbath. Prior to this almost every pew was full. When I returned to Anchorage less than a year later, I couldn’t believe my eyes!! Once again the church was almost full. New converts had come in—-converts on fire to join the pastor in evangelistic work. Eager and happy to stand for the truth. Some of the former members now attend liberal churches and some dropped out of Adventism altogether. I hope we stay our course and don’t get all tangled up in an out-cry over the decision of people who choose error over truth. There’s always an angry stir and mean accusations that follow when members leave the church “wounded” by God’s truth. Fascinating stuff. Let’s remember Martin Luther left the Catholic Church when he had the audacity to challenge Catholic dogma. As much as one can try to shoehorn the reality of science into fundamental principles, the preponderance of scientific knowledge will not be denied. The wedge of science it truly being driven into Adventist dogma to create a literal remnant split off from rational thought. You accuse such persons as Sean and myself of seeking “doctrinal purity,” and being the modern-day “Concerned Brethren.” I for one count both of these accusations as compliments! It was the apostle Paul who instructed Titus to show “uncorruptness” in doctrine (Titus 2:7), and declared to Timothy that in taking heed to doctrine “thou shalt both save thyself, and them that hear thee” (I Tim. 4:16). Regarding the “Concerned Brethren,” some on this forum may not know who you are talking about. For those who don’t, this term was used by the original group of ministers and laity in the Australasian (now the South Pacific) Division back in the 1960s and ’70s, who opposed the unscriptural teachings of Desmond Ford regarding salvation, the sanctuary, and other issues. Had their warnings been properly heeded, the spiritual devastation that has come to the church in that part of the world because of these perverse theories would likely have been averted. May God give us many, many more Concerned Brethren and Sisters!! Led by the voice of our new General Conference president, may the call for revival and reformation grow deafening in the ears of those who would compromise and deny our faith. By the way, for those who have not yet had the chance to hear all (or any) of Elder Wilson’s Sabbath sermon, go to the Web site It is on the home page. I will let Sean Pitman, who is far more a scientist than I, respond to your insinuations about science and creation. But frankly, your talk of “scientific knowledge” and “rational thought” sounds too much like those in Noah’s day who insisted it could never rain, and that God’s message for that time was therefore a delusion. It has ever been perilous for human beings to test God’s Word by accepted science, rather than the other way around. Remember Galileo? Remember how perilous it was for him to challenge God’s word of the day? Science is progressive not regressive, no matter how much people try to shackle it. Fire and brimstone philosophy has been around for a long time but it will not stop the advance of knowledge. Moreover, the Word of God is not the franchise of a few but open to interpretation by all. That’s free will and democracy my friend. Bobbie Vedvick, the quote you asked about was a parody, penned by me. Faith (and many others in this thread), the comments about those who will be driven out of SDAism by this push tend to assume that they are in disagreement with what has always been SDA belief. This is not the case: the very strong literalist recent creationist position is a relatively recent view. Note that what has happened at this GC is a vote for a *change* to Fundamental Belief 6. SDA beliefs are being *changed*, and those who won’t go along for the ride told they have no ce in the church. Yes, you are speaking of free will–the choice either to travel the narrow road to heaven or the broad road to hell (Matt. 7:14). According to Ellen White, on the broad road “there is room for every man’s opinion and doctrines” (MB 138). That seems to be the road you would like people to travel on the core issue of how we got here. I am a lifelong historian, and well acquainted with the experience of Galileo. The problem with the church of that day was not reliance on Scripture or a literal interpretation thereof, despite what people claim. That was the same church that burned Protestants because they stood by Scripture and opposed human tradition. It was human tradition that insisted the earth was the center of the universe, which the Bible nowhere states. Just because there are some who misuse ecclesiastical authority does not mean it is never to be used. Thanks for confirming what I most feared. I do hope Sean is paying attention and realizes that his hopeful idea of a simple relatively harmless procedural change in a University completely misjudges the mood of rabid sectarianism, completely devoid of Christian charity, that characterises his supporters on this site. The eagerness with which you embrace the prospect of purging the family of God gives the lie to the idea that you have any conception of Grace and the incarnate God who loved unto death. This is my first time commenting on this website. I’m finding it hard to contain myself. I just finished listening to Elder Wilson’s sermon again from the GC Session. I’m so excited to see and hear such a powerful straight testimony coming from the very top. God is about to do great things through His church! I was in awe as I was sitting in the Georgia Dome listening to the message. I feel even more inspired and more motivated to do my part in working to spread the 3 Angels message. I pray that we’ll each redeem the time and get as busy as we can, being about our Father’s business while giving due diligence to a faithful study of His word and the Spirit of Prophecy. There is a happy fiction told in the evolutionist lounge that is to the effect that Adventists only recently came up with the idea that the Seventh-day of Creation week is Saturday and has been that way since the Garden of Eden when God finished making all life and rested on the 7th day (as if “SIX DAYS you shall labor…for in SIX DAYS the Lord made”) is a new Adventist “invention”. Here is an example oAdventist commenting on this very idea – that is not as “new” as some might like to imagine. I love hearing how this is a recent view for Adventists. Remember Galileo? Remember how perilous it was for him to challenge Godâ€™s word of the day? Science is progressive not regressive, no matter how much people try to shackle it. Fire and brimstone philosophy has been around for a long time but it will not stop the advance of knowledge. Another happy fiction evolutionists like to tell themselves. Galileo was not challenging the word of God – he was challenging Ptolemaic astronomy. And where the problem came in was to the extent that Ptolemaic astronomy had been wrong-headedlyy “married to the Bible” by misguided RC tradition seeking to blend the bible with what they thought of as “science”. But in fact there was no “11th commandment” stating “For the earth is the center of all creation and is not in motion, nor doth it orbit any object in the heavens”. This is simply another example of a evolutionists not letting inconvenient details get in the way of a good story. I found the video online. Well said, Yolanda. I join you in a renewed committment to being about our Father’s business. The merciful and faithful Creator is moving with a strong arm. With Zacharias, we can continue to say, “Blessed be the Lord God of Israel” (Luke 1;67). 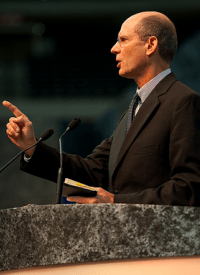 As much as I laud Elder Wilson’s staunch orthodoxy and his much needed effort to counteract the inroads of unbiblical influences – I have to confess I was uncomfortable with some aspects of his presentation. While Elder Wilson was preaching primarily to an Adventist audience, he also had the ear of the non-Adventist world – most of whom are not familiar with our doctrines. Babylon, The Mark of the Beast, Sabbath vs Sunday, the Annihilation of the wicked etc. are ‘strong meat’ subjects reserved for the latter portions of evangelistic series after persons have been more fully prepared to receive them. Without such preparation they can be unnecessarily hardened against our message. I’m not sure that this venue was the appropriate one for a ‘full message,’ ‘both barrels’ kind of presentation of testing truths. Many Adventists of course believe our job is to tell people about the Mark of the Beast and let the chips fall where they may – to hand them a ‘National Sunday Law’ book and be on their way. This approach is not in harmony with Ellen White’s counsel in MH 143. Granted, at the close of time the test of loyalty will be brought more prominently before the world and the closing movements will be rapid ones. Perhaps Bro. Wilson believes we are in that time. I might be offended. Yes, it might drive me to study the issues more thoroughly and accept the truth. On the other hand, if I saw a person repeatedly exalt the importance of the scripture, and then imply that a scriptural word that clearly means one thing, can also mean something it clearly doesn’t – I might have second thoughts. Of course we as Adventists know exactly what he’s talking about. We as Adventists should also be the most missions oriented people on earth. True missions is ‘incarnational.’ We should be constantly seeking to place ourselves in the shoes of those we are trying to reach with the gospel. Those who are raised in the faith may have a tendency to see everything through Adventist spectacles – becoming insensitive and insular in their interactions with non-Adventists. In closing, I guess I would have preferred to hear more of what Jesus has done for Ted Wilson personally. I would have preferred to hear a more thoroughly Christ centered message as opposed to a doctrinal message with references to Christ’s righteousness sprinkled in. Finally, before I am shot by half the people on this site – I rejoice in the focus on upholding our Sabbatarian/Special Creationist roots. Praise God that reforms are on the way in this regard. “As witnesses for Christ, we are to tell what we know, what we ourselves have seen and heard and felt. If we have been following Jesus step by step, we shall have something right to the point to tell concerning the way in which He has led us. We can tell how we have tested His promise, and found the promise true. We can bear witness to what we have known of the grace of Christ. This is the witness for which our Lord calls, and for want of which the world is perishing.” –The Desire of Ages, p. 340. Did Wilson explain how SDA members can actually hold our leaders accountable?We have many leaders out here in the Pacific Union Conference who have not been accountable and still arenâ€™t, but what can ordinary â€œJoe and Jill Schmoâ€ church members do? I wondered the same thing. I just realized this year that I really don’t know enough about how our church works and how changes are made. It’s my intention to study this out. Of course Biblical principles and a Christlike attitude must be followed (Matthew 18, and Proverbs 17:9–“He that covereth a transgression seeketh love; but he that repeateth a matter separateth very friends”). Biblical principles and Christlike attitude first, church policy second. Sometimes it’s appropriate to hit-the-nail on the head. Take for example Jesus’ statement to the Samaritan woman, “Ye worship ye know not what: we know what we worship: for salvation is of the Jews.” That might seem inappropriately direct, but it wasn’t. It was just what she needed. The scattered servants of Christ needed to hear the president of the world church express a clear understanding of where the church needs to go. And my own experience with non-Christians is that they respond much more vigorously and appreciatively to a meaningful presentation of the Bible than they do to a generalistic and generic appeal to their feelings. I’m sure you aren’t advocating a meaningless presentation, but I’m all for exactly the type of message President Wilson gave. I suspect those outside the church who care enough to listen to his message appreciate the frankness with which this leader expressed the direction he intends to go. I think many of them know he wasn’t targeting them – he was talking to us. Thanks for clarifying, but I will have to take my stand with the Bible as it reads. Though I know we can “wrestle the scriptures to our own destruction”, I prefer God’s simple, clear description of what constitutes a “day”: “The evening and the morning were the first (and then second, then third, fourth, fifth, and sixth) day. I can’t even begin to imagine a morning lasting a “zillion” hours and an evening of the same length. No, the miracle of the Bible is that it’s deep and rich enough for the mind of a genius yet simple enough for a child—-and me. The only requirement to understand is an ernest desire to let God teach—-not man. I want on that ship of “Concerned Brethren”. It’s the only one pointed in the direction of Home. Bob, I appreciate the zeal and conviction with which you make your point and the distinction between the Word of God as interpreted by Catholics versus the SDA. So why does what the Catholics thought of science, which evidently was wrong, differ from what the SDA think of science? In each case faith and interpretation of the bible over ride objective investigation. And in each case, whether it be Galileo or Darwin, the church vilifies the scientist. I thank you for improving upon my point. Maybe the Catholics were wrong about science because they ignored the very clear and simple explanations of the Bible. God clearly spells out what a day consists of. One of the last warnings of Jesus before closing the last chapter of the Bible was to not change one jot or tittle contained therein. Let not the Adventists fall into the same trap as the Catholics in letting man’s complicated twist undo the plain teachings of God. God doesn’t need and didn’t choose for His disciples those who thought themselves so highly educated that they wouldn’t accept His teachings. Education is beautiful but only IF, as in the case of the Magi, there philosophies and studies are in accordance with the scriptures. Victor,Sometimes itâ€™s appropriate to hit-the-nail on the head.Take for example Jesusâ€™ statement to the Samaritan woman, â€œYe worship ye know not what: we know what we worship: for salvation is of the Jews.â€That might seem inappropriately direct, but it wasnâ€™t.It was just what she needed.The scattered servants of Christ needed to hear the president of the world church express a clear understanding of where the church needs to go.And my own experience with non-Christians is that they respond much more vigorously and appreciatively to a meaningful presentation of the Bible than they do to a generalistic and generic appeal to their feelings.Iâ€™m sure you arenâ€™t advocating a meaningless presentation, but Iâ€™m all for exactly the type of message President Wilson gave.I suspect those outside the church who care enough to listen to his message appreciate the frankness with which this leader expressed the direction he intends to go.I think many of them know he wasnâ€™t targeting them â€“ he was talking to us. Robert, I agree with you AND with Victor. I don’t really know what the answer is. In the information age, everything has changed. We have to rethink a lot about how we do things. We want to have a private evangelistic series and present truths by presenting the building blocks first, and building understanding before presenting the “more difficult aspects.” But how can we now? The last meetings we held, people went home and googled our personal names as well as doctrinal topics. Sure we want a clear and meaningful message, but we want to protect those who are not ready to receive all of the truth at this time. We don’t want to push them away. It isn’t that we are afraid of offending them personally. It’s that we don’t want walls to go up so that we can’t reach out to them successfully. I don’t know what the answer is. Even this forum is disturbing when our members have out and out conflicts, especially when behavior is not becoming of a Christian. It’s available for the whole world to see! What it comes down to is things are different now. We need to approach everything differently. Otherwise, evangelistic interests will begin to think of us as the religious “Amway” brigade and lock their doors before we go up the steps. Thrilled to be assured that God is leading his church. No matter what trials are, He will lead us to the end. Come quickly dear Jesus. So, does that mean that God clearly spelled out 2300 days in Daniel 8:14, or has that somehow received a ‘complicated twist’ to turn days into years? Even interpretation within a denomination, versus between them, has its problems I guess. I’m going to assume, if you’re a Seventh Day Adventist, you’re well versed in the difference between a prophetic day and a literal day. I’m not a scholar in the prophecies but I do know in the creation God was simply telling us the origins of the earth and not alluding to events in the future. In so doing he was very careful to state after each day’s work what He meant by a day. This is very simple and basic; nothing mysterious. Nothing that requires us to turn our understanding over to a human scientist. But then I also presume, if you’re a Seventh Day Adventist, you’ve already heard all the “arguments” and have made your decision. As for me the evolution theory will never move me from that literal morning-evening day, which has always been from the beginnings of the Bible a 24 hour day. All other books and scientific teachings must agree with the Bible first or it’s complete folly to me. This is what set the scientific studies of the Magi apart from the other philosophers of their highly educated culture. As they studied science it drove them to the Scriptures and convinced them of truth; science today, as in your argument, would pull me away from the plain word of God. That’s the first red flag. The truth is simple, not complicated; if it weren’t so, we would have to submit our minds blindly to only a select group. That’s always a dangerous thing. God has spoken in such a way the average person can read and understand and I’m not willing to give up His guidance for “the wrestling of the scriptures” offered by man. In answer to my prayers His guidance has convinced me beyond a shadow of a doubt that He meant exactly what He said regarding the meaning of a day. And I have no problem understanding and accepting there’s a difference in a prophetic day. Have a wonderful day, whatever length you perceive it to be. Sometimes itâ€™s appropriate to hit-the-nail on the head. Take for example Jesusâ€™ statement to the Samaritan woman, â€œYe worship ye know not what: we know what we worship: for salvation is of the Jews.â€ That might seem inappropriately direct, but it wasnâ€™t. It was just what she needed. If the Smaritan woman had not had a preparatory, one-on-one, personally disarming request for water from Jesus – a man who was a Jew – then that pointed statement would have seemed like nothing more than sectarian Jewish bigotry. Re: Bobâ€™s quoteâ€œGalileo was not challenging the word of God â€“ he was challenging Ptolemaic astronomy. And where the problem came in was to the extent that Ptolemaic astronomy had been wrong-headedlyy â€œmarried to the Bibleâ€ by misguided RC tradition seeking to blend the bible with what they thought of as â€œscienceâ€.â€Bob, I appreciate the zeal and conviction with which you make your point and the distinction between the Word of God as interpreted by Catholics versus the SDA. The problem with LSU is that they are doing what the Catholics in your story were doing: The church leaders tried to force a doctrine on the church on the basis of then-current science, just as some LSU teachers are trying to force a now-current scientific worldview on their students and supplying quasi-religious beliefs and philosophies to justify it. It didn’t work then, and it’s a bad idea now. Back then, new science came along, and proved the old-school science, along with the quasi-religious tenets based on it, to be invalid. I have faith that new science will do this to much of current evolutionary theory, and in fact already has challenged old Darwinist assumptions in many areas. A better parallel to that story of Galileo’s is that the Roman Catholic Church (which held control on ALL education at the time) = the modern Darwinist establishment, dogmatically forcing their views on everyone and persecuting everyone who disagrees. (As in the video documentary, “Expelled.”) The RCC was not a Bible-focused community, it simply used religion as a convenient excuse to exercise power; the strength of the Reformers, by contrast, was their commitment to the Bible as the inerrant Word of God. Eventually science will vindicate what the Bible teaches, excluding subjects on which scientific information will never be available or conclusive. To that end we want LSU’s students to be ready and on the cutting edge, by taking God at His Word. Bravus: If they are in agreement with the church, then they would be rejoicing with the rest of us over this “push” of truth. This is according to the old principle that rules don’t bother those who keep them–only those who want to break them. As to this fundamental belief that the world was created in 6 literal 24 hour days and (yes, I dare to say it) roughly 6,000 years ago being a recent view, I fail to see your reasoning. It is as plain as day in the Scriptures, (which I am sure you realize was not recently written.) Don’t be deceived, Bravus. Anyone who tells you different is a-lying. The only reason the church has to “change” the fundamental belief is to spell it out more clearly for those people who are trying to “misinterpret” it so they can attempt to weld truth with error. Open your eyes, Bravus, before it’s too late–for you and your friends. Holding accountable can consist of expressing concerns and speaking up, such as is being done on this website, after first spending awhile trying to work with LSU privately. Ted Wilson’s statement about members holding an institution accountable seemed to me to be referring to what this website has been doing. The inconvenient detail missing in your solution above is that Adventists did not argue in favor of the Bible statement on a literal 7 day creation week as a “compromise with science” the way that the RCC bent the Bible for Ptolemy. Applying that same rule today – the first example of bending-the-bible for wrong-headed-science is being conducted by theistic evolutionists. Since you give no example of God’s Word saying “SIX DAYS you shall labor…for in SIX DAYs the LORD MADE” being a compromise between the text and science your argument fails to get off the ground. I see now that Michael Prewitt has also noted this flaw in your argument. Holding accountable can consist of expressing concerns and speaking up, such as is being done on this website, after first spending awhile trying to work with LSU privately.Ted Wilsonâ€™s statement about members holding an institution accountable seemed to me to be referring to what this website has been doing. Bob, I agree with you completely. But, you see how this website and those who contribute are hammered by the liberals for not having a “christian” demeanor. While the liberals on AT and Spectrum hammer our SDA Church constantly, we can’t lift a voice FOR God’s Truth, according to them! For over a year, this website has done its job. However, what has been actually DONE? Nothing! So, the results of holding someone “accountable” is still nothing. Will there be some accountability in the future? I have serious doubts. I appreciate the distinctions you are making between the Catholic Church and the SDA Church. So it was not OK for the Catholics to strong arm Galileo because The Catholics were wrong about their science, but it is OK for the SDA to sanction the LSU biology professors, and perhaps Dr. Clausen, because the SDA is absolutely right about its science. Is that about the gist of it? Be brave Dr. Clausen and Dr. Bradley, you follow in the footsteps of giants of science, irrespective of their faith. Do you feel Ted Wilson in the end won’t push forward beyond his words; or do you feel there isn’t enough backbone in the rest of the conference to make the needed changes? I’ve had such high hopes. Spirit of Prophecy does say the last work will be carried out by the lay people and not the leaders. Perhaps because the majority of the leaders are made of jello?? I was surprised the vote regarding the creation issue was 75%. WHO are the other 25% and what are they doing serving in the general conference? Rather alarming. Wow, I just listened to the sermon (thanks for the 3AngelsTube link); it brought tears to my eyes! We have a real, fundamental, biblically literalistic and conservative President: praise God! I expect to see great things happen in our church. I’m already inspired to do more, much more for God. The Catholic Church wasn’t so much wrong in wanting to defend its own views of what it thought was right at the time, but in appealing to the arm of civil power and authority to enforce its views on civil society at large. In other words, no one could just leave the Catholic Church or challenge the Catholic Church at all – not even from outside of the Church because there was no viable option to leave it. (Quote)Ron Stone:Do you feel Ted Wilson in the end wonâ€™t push forward beyond his words; or do you feel there isnâ€™t enough backbone in the rest of the conference to make the needed changes?Iâ€™ve had such high hopes.Spirit of Prophecy does say the last work will be carried out by the lay people and not the leaders.Perhaps because the majority of the leaders are made of jello? ?I was surprised the vote regarding the creation issue was 75%.WHO are the other 25% and what are they doing serving in the general conference?Rather alarming. I believe Wilson does plan to go further. However, I am fully aware of the deeply rooted hatred for Wilson out here by the liberals who control much of what is going on. Just check out AT and Spectrum. Regarding the vote, was it by voice, hand raising, or do we have a “hard copy” of who voted how? Anyone know? Dear Michael and BobThanks for your comments. The gist of my point is that it is a myth that the incident between the Catholic Church and Galileo is an example of what happens when Christians use the Bible as a filter for science. And conversely, the Bible can and should be an authority on every topic that in contains, including origins. The Bible SHOULD BE a filter for evaluating everything in life, including science, that is relevant to its claims; that, I believe, is the justification for this website and movement. If that filter were ever to prove false, we could as soon throw the Bible out. But in the case of that story of Galileo, that is not what happened. The RCC’s position was not derived from the Bible at all; it was derived from then-accepted science. One faction (the church) was using religious (but not Bible-based) and scientific excuses to persecute another person of another faction. If the church had stuck to what the Bible actually taught, the incident would never have happened. And insofar as we stick to what the Bible actually teaches, I don’t believe we have any fear of being blinded to any truth about the world we live in. There is also the issue of the church back then being a civil power, as Sean pointed out. No one here is suggesting that the LSU teachers must not be allowed to teach millions-of-years evolution ANYWHERE; just not at LSU. Bravus, I’m sure you’ll understand, being an Australian, this illustration using Australian politics. What would the Labor party do if there were a bunch of Liberals in the party trying to work their own agenda? Do you think the Labor party would rejoice if Tony Abbott applied to become a member? Would they welcome him, hoping that he would eventually accept the Labor agenda and “convert” over? Or would they rather weed them out because their real agenda is to undermine the party? A church is not a political party, but the principle in this case is similar. Nobody forces anyone to join a political party, and nobody joins unless they agree with the fundamental beliefs of the party. Nobody is forced to join the Adventist church, but if someone does join, we expect them to uphold our beliefs, not work to try to undermine them. And, as has been mentioned by others, the SDA church has believed in a literal, 6-day creation for a very long time, since its inception pretty much. Everyone is entitled to believe what they want to believe. But are you entitled to be publicly seen to be an Adventist if you don’t believe the fundamental Adventist doctrines? If Tony Abbott came out and said “I’m a Labor true believer”, would you believe him? Or do his actions and words give him away? If you don’t agree with the SDA church, why hang around? You’re not saved by being there. And, we don’t really want you being a stumbling block to those who do want to be there. You’re welcome to try to influence them if you want, but in your own time and place, NOT IN THE CHURCH. As it turns out we do not teach the immortality of the soul or atheism as valid options in our schools. If you want that – you can go to public universities or certain other private schools. This is really ‘not news’. Our understanding is that belief in theistic evolutionism “is the worst form of infidelity” and why should a Church – create a school dedicated to the “Worst form of infidelity” in its biology and religion departments? It would be better for a Church to just stick to Gospel evangelistic crusades rather than to divert resources to such a wrongheaded mission. Surely this is not the hard part of this dicussion. I would hope you would agree. I was there for the vote. The motion was split into two parts. Part 1. The motion to affirm the 2004 statement – the “affirmation Creation”. The vote was taken by raising yellow cards (a yellow 8.5×11 page from what I saw). The vote was massively overwhelmeng. About 2000 to 5. Part 2. The motion to authorize the Exec Comm to update FB6 to bring it in line with the more explicit wording of the “Affirmation” just approved, and then submit it in final form to the GC session of 2015. That one passed by about 2000 to something close to 25. (I think I have them both on video but will check my tapes). I have no clue where they are getting a 25% margin voting against it – unless they have hidden rooms where people are voting outside of the delegate floor area – and to be honest I saw no evidence of that whatsoever. Well your eye-witness stats are more encouraging! The man who originally quoted a 2/3 win (I was wrong on the 3/4 win) says he got it from a lead in the Gleaner and is now trying to find that statement to forward it to me. Who ever reported on the session, obviously either got the stats wrong or it was a typo. Thanks for the positive correction. I presume it was by ballot?? Gentleman, I appreciate your collective, erudite comments and the fine distinctions made. No sense beating a dead horse further, except to say I appreciate how you said it as much as what you said. Keep up the good debate. Everyone held up their yellow voting cards for “yes” or for “no”. It was a “sea of yellow” for the yes – and about 25 cards held up for “no” on that second vote. The first vote only had one or maybe two in the “no” column and it is hard to tell the difference between two “seas of yellow” in the yes column for the two motions, so I just call it 2000 to near-nill. Sounds like a landslide. Bad news for the liberals. However, as they have done in the past out here in the Pacific Union Conference, they will simply ignore the vote and do as they please, as we see at LSU. My guess on the two-thirds thing is that what is actually being said is ‘more than two-thirds’. 99% is more than two-thirds… that specific number was chosen, not as the actual vote-count, but as a break-point: some motions need a simple majority, some need a two-thirds majority… and the vote well and truly delivered that, and more. Clearly you are mistaken to cast judgement on a large number of people presuming to know their hearts and motives!